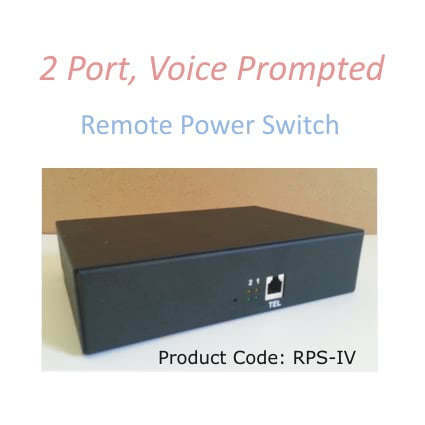 The RPS IV (RPS-4) is a voice prompted, Two port, telephone-activated “power control” switch. Available in 120V US voltage. This feature rich power controller enables you to power up, power down, or reboot your equipment ( up to 12 Amps) through a single phone line. The device uses voice prompts for easy user control of the power functions of the unit. FEATURES: Power On / Off / Reboot • 2 Electrical Ports allow for INDIVIDUAL control of 2 different connected devices through your telephone. • Rated at 12 Amps with an individual port rating not to exceed 8 Amps. • Dimensions 7″ Length x 5″ Wide x 2″ Thickness. • Operating Temperature Range: 32°F ~ 104°F, For Indoor Use Only. • Secure Password Access by DTMF tones. • Has 1 Phone Jack. • Typically Ships within 3 business days. • Provides real-time power status over the phone. 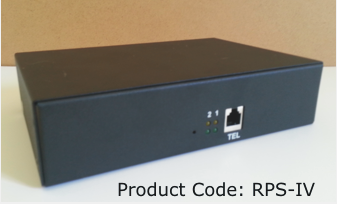 • Eliminates costs associated with travel to and from a site to power control your equipment.• 1 Year Warranty. 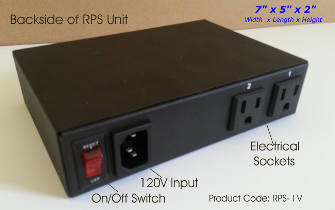 The RPS-IV is a call-activated “power control” switch. Available in 120V US version. This feature rich power controller enables you to power up, power down, or reboot power to your equipment ( up to 12 Amps) through a single phone line. The device uses voice prompts for easy user control of the power functions of the unit. 110-120V US, 12 Amps Maximum for all ports, with a 8 Amp individual port limit. Operating Temperature Range: 32°F ~ 104°F, For Indoor Use Only. Dimensions 7″ Length x 5″ Wide x 2″ Thickness.